A new militant group called the Red Scorpion, based in Imo state, has claimed responsibility for blowing up two pipelines belonging to Elf Oil Company in Awara in Ohaji Egbema Council Area of Imo State. This admission comes as the militant group had threatened to blow up the Shell Pipelines in Oguta. 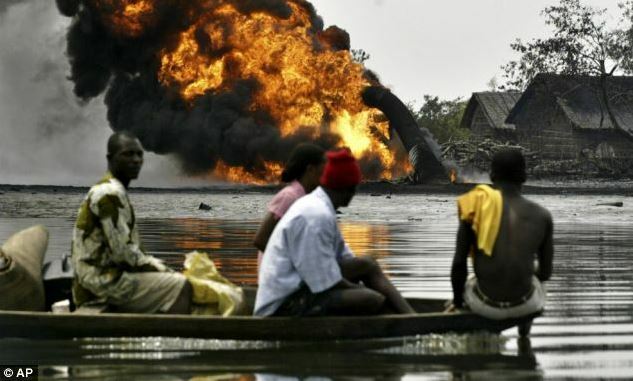 The group in a post on their Facebook account yesterday, said that their threat should not be taken as an empty one as they have the capability to carry it out, warning that until the oil producing areas in the state are given their due, the oil companies operating in the areas will know no peace. Meanwhile, some of the ex-militants from the area, who confirmed the existence of the new group, said that they were not part of the renewed spate of militancy. RED SCORPION OR WHATEVER NAME YOU CALL YOURSELF, WHY ARE YOU GAYS INTERESTED IN DESTROYING YOUR FUTURE IN THE NAME OF QUICK MONEY THAT WILL NOT TO YOUR OLD AGE. FEDERAL GOVERNMENT WHY SETTLING THIS CRIMINALS OR DO WANT ALL YOUNG NIGERIANS TO BE CRIMINALS? YOUTHS OF TODAY THINK TWICE REGARDING YOUR ACTIONS TODAY AS YOU ALL REGRET ALL YOUR EVIL ACTIONS TOMORROW.